[Exclusive. No, Not Really] Nearly every other site posting these pictures have been tagging the post as Exclusive for reasons that evade me, so I thought I would too. I am guessing that AsRock must have sent out PR images to multiple sites because many sites Including Tom’s Hardware and AnandTech have understandably rolled out nearly identical exclusives. This post is all about pictures. Infact, you probably wouldn’t want any preliminary talk at all. But I can’t do that, so we will go over the dreaded context before the pictures. I have a feeling that not many people will read this para but here goes. So both the boards are based on the Intel 9 Series chipset and carry the LGA2011-3 socket. The boards have eight DDR4 memory slots for quad-channel memory and a grand total of five PCI-Express 3.0 x16 slots. These offer upto 40 Lanes of PCIE. They both have ten SATA3 (6 Gb/s) ports and your usual USB 3.0 and audio ports. Now the more interesting thing about these boards is that both of these rock Two M.2 Slots. 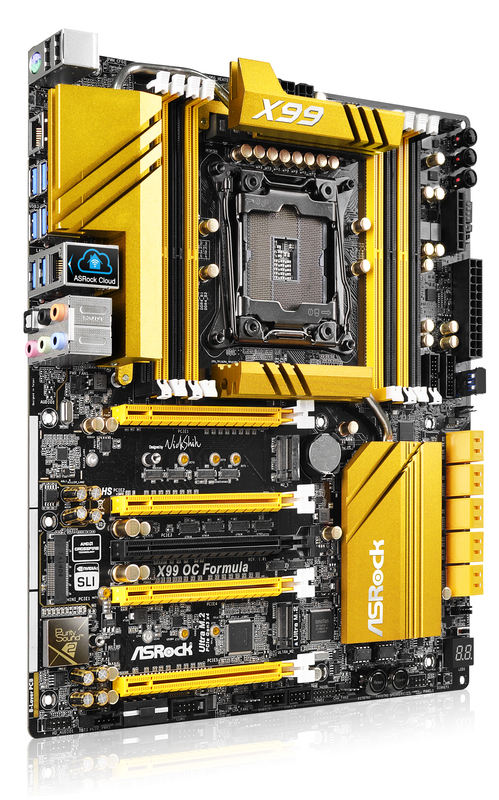 The ASRock X99 OC Formula is a beauty in all of its glorious yellow and black color scheme featuring ASRock’s conformal coating, Super Alloy Design and signed by ASRock’s in-house overclocker, Nick Shih. This board has a ton of features and is jam packed with so many technologies, that it gets ridiculous to detail each one of them. 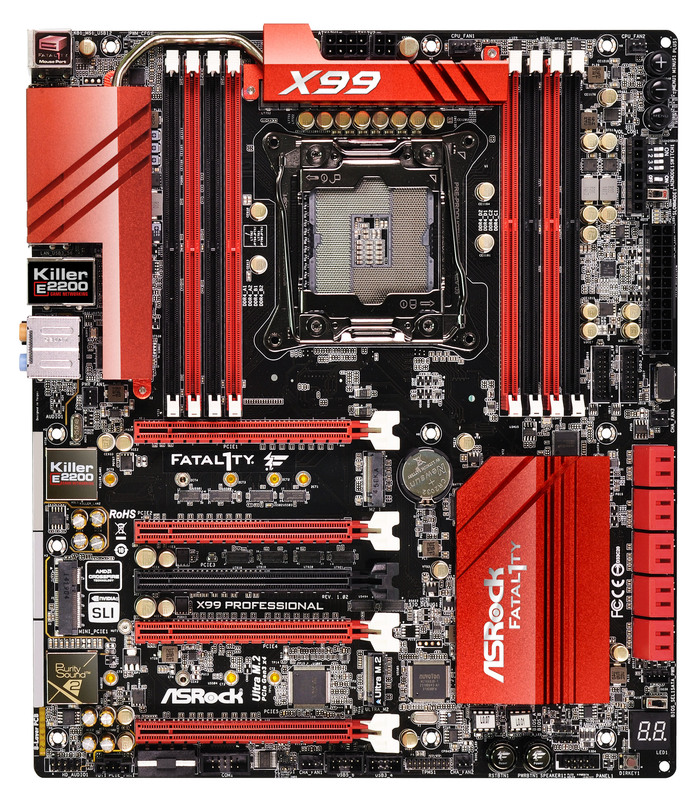 In terms of design, the ASRock X99 OC Formula makes use of a 12 Phase PWM and the socket is powered by a 8-Pin+4-Pin EPS connector scheme in addition to the 24-Pin power connector that provides juice to the board. Since this is built by ASRock, we expect to see some high quality components including the Super Alloy Power design which includes 50G Aluminum Alloy heatsinks, Premium Alloy Chokes, Dual-Stack MOSFETs, Japanese made high-quality conductive polymer capacitors to make is run and perform better. The board has four sets of heatsinks, two for the PWM and power area which are located on the top and interconnected via a heatpipe while the second set is located over the PCH and below the socket which are also connected through a heatpipe. The side of the DIMMs include several overclocking options such as Menu and Plus/Minus buttons to adjust BCLK. The menu switch opens up the BIOS directly on boot while the LN2 mode, PCI-e Disable switches and Voltage check points can also be spotted. The design is quite beefy and we can see several components scattered across the PCB so ASRock is making use of every inch of the space they can get. For storage, the X99 OC Formula provides 10 SATA 6 GBps ports, two USB 3.0 header and two USB 2.0 headers. A Dual BIOS and Diagnostic LED can be found below the SATA ports. Expansion slots include 5 PCI-e 3.0 x16 slots which are provided extra power through a 4-Pin connector near the bottom of the board. The board supports both AMD CrossFire and NVIDIA SLI Multi-GPU functionality. There’s a PCI-e Ultra M.2 interface which provides 10 GB/s bandwidth for SSDs along with a standard mSATA port. Being a FATAL1TY motherboard, ASRock has also included their Purity Sound 2 design on the PCB which is isolated from the rest of the components and has a ALC1150 codec underneath the EMI shielding which is placed right next to another mPCIe port which can be used for WiFi and wireless connector cards. I/O on the motherboard includes 2 USB 2.0, 6 USB 3.0 ports, a PS/2 port, e-SATA port, Gigabit Ethernet LAN ports and a 7.1 channel audio jack. 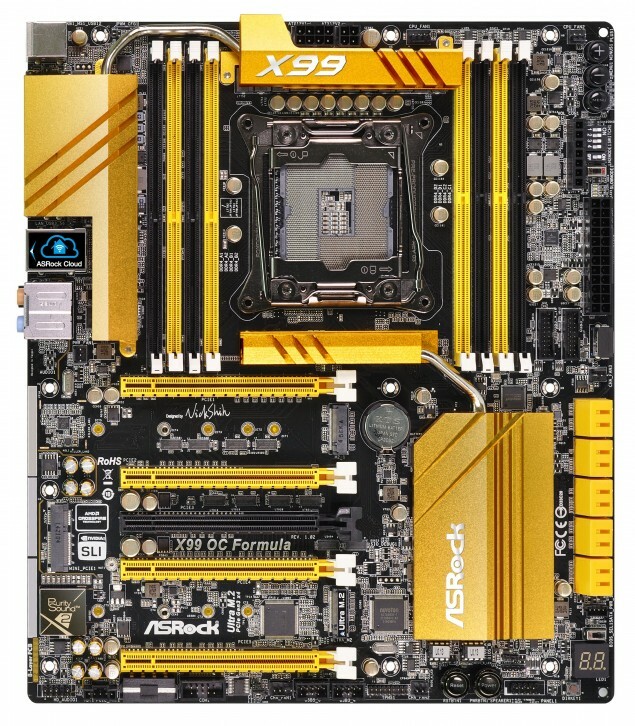 In terms of design, the ASRock X99 Professional makes use of a 12 Phase PWM and the socket is powered by a 8-Pin+4-Pin EPS connector scheme in addition to the 24-Pin power connector that provides juice to the board. Since this is built by ASRock, we expect to see some high quality components including the Super Alloy Power design which includes 50G Aluminum Alloy heatsinks, Premium Alloy Chokes, Dual-Stack MOSFETs, Japanese made high-quality conductive polymer capacitors to make is run and perform better. The color scheme is red and back for the board which is similar to the ASRock X99 Killer FATAL1TY series which were displayed a while ago by ASRock. The board has four sets of heatsinks, two for the PWM and power area which are located on the top and interconnected via a heatpipe while the second set is located over the PCH and below the socket which are also connected through a heatpipe. The design is quite beefy and we can see several components scattered across the PCB so ASRock is making use of every inch of the space they can get. For storage, the X99 Professional provides 10 SATA 6 GBps ports, two USB 3.0 header and two USB 2.0 headers. A Dual BIOS and Diagnostic LED can be found below the SATA ports. Expansion slots include 5 PCI-e 3.0 x16 slots which are provided extra power through a 4-Pin connector near the bottom of the board. The board supports both AMD CrossFire and NVIDIA SLI Multi-GPU functionality. There’s a PCI-e Ultra M.2 interface which provides 10 GB/s bandwidth for SSDs along with a standard mSATA port. Being a FATAL1TY motherboard, ASRock has also included their Purity Sound 2 design on the PCB which is isolated from the rest of the components and has a ALC1150 codec underneath the EMI shielding and the Killer E2200 LAN chip which is place right next to another mPCIe port which can be used for WiFi and wireless connector cards. I/O on the motherboard includes 2 USB 2.0, 6USB 3.0 ports, a PS/2 port, e-SATA port, Killer E2200 Gigabit Ethernet LAN ports and a 7.1 channel audio jack. The motherboard is jam packed with a ton of features however we don’t have a price for this bad boy yet but expect it above the $400 US considering its design and targeted market which is the professional minded users along with the enthusiast community. 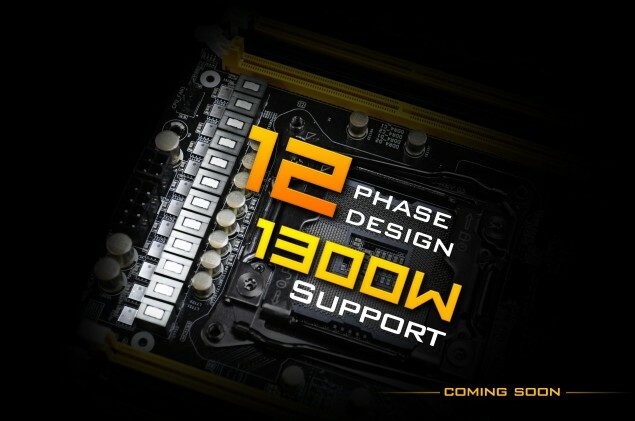 Expect more news on the X99 chipset boards and Haswell-E processors during this month.